Going on a trip at some beautiful place is one of the wonderful ideas to keep your kids and other family members graceful. But this requires you to book a room at some beautiful hotel, which could be an expensive overhead. 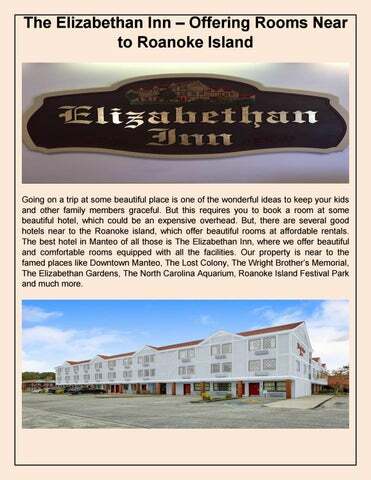 But, there are several good hotels near to the Roanoke island, which offer beautiful rooms at affordable rentals. 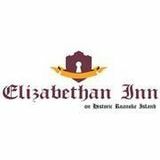 The best hotel in Manteo of all those is The Elizabethan Inn, where we offer beautiful and comfortable rooms equipped with all the facilities. Our property is near to the famed places like Downtown Manteo, The Lost Colony, The Wright Brotherâ&#x20AC;&#x2122;s Memorial, The Elizabethan Gardens, The North Carolina Aquarium, Roanoke Island Festival Park and much more. We are situated near to the beautiful beaches and lighthouses of the Outer Banks town. Our hotel offers you the most beautiful and comfortable apartment-based rooms of various ranges. Our room categories include king specialty, efficiency, apartments, and more, from which you can choose one per your choice and budget. We are close to the coastal waterways and parks to make you enjoy the beautiful views of sunrise and sunset amidst the natural beauty. You can also enjoy there with swimming, boating, kite flying, and doing much more near to our hotel. You may visit our official website to see the pictures of those and book one on those online in a quicker way. Our property is amongst the best choices of the honeymoon couples, where you could experience overwhelming hospitality. We assure you the visit of our clients at the Roanoke island with staying at our hotel would be worth remembering for the lifetime. We also have our Outer Banks restaurant offering exotic Italian cuisine, La Dolce Vita. All our hotel staff members are trained to be very humble and friendly with our clients. Our restaurant chefs are experienced in cooking foods and recipes for the customers visiting from multiple countries. We are also close to other famous restaurants, such as Stripers Bar & Grill, Ortegaz, Lone Cedar Café, Full Moon Café, Avenue Grille, O’Neals Seafood Harvest, Sugar Creek and Sugar Shack, and more.